We need to change the way we communicate. Right now. Here in the UK, everyone is reacting to other people’s reactions, in an insane run of events that has led to unprecedented turmoil and upset. People aren’t talking to each other. Germany refuses to talk to the UK parliament until they begin the leave negotiations. Labour ministers refuse to talk to their leader about the best way forward. The Prime Minister is resigning, leaving the talking to whoever takes up the difficult role. Friends are attacking and “unfriending” each other all over social media. This sort of behaviour is based in punishment: an eye for an eye. We have been hurt, we will hurt in response. We are emotional creatures.With the lines of communication closed, we are stuck here in limbo, everyone reacting instead of acting with intention. Reactive behaviour is, for the most part, usually not the best behaviour. Emotional responsibility is something that is seriously lacking in our society. In fact, any responsibility is met with apprehension, especially personal responsibility. Far too many are eager to find power under the guise of responsibility for others, but when it comes to perhaps changing their own behaviour they will never even consider it. It’s everyone else’s fault, people are stupid, people are ignorant. We will not even talk about changing our own behaviour, lest we admit to something that needs improvement. Sure, we’ll criticise the hell out of others, for don’t we see that every day in the media, from television entertainment shows to the PM’s questions every Wednesday lunchtime? And yet, where is the real communication? If we are emotionally responsible, we won’t simply unfriend someone on Facebook because they didn’t vote the same way we did. So what if a friend voted for Leave? So what if a Remainer said something stupid in response? They are reacting. We can stop, see their pain, see their fear, try to see why they are reacting in such a way. In that stopping, in that attempt to understand, there is compassion. And where there is compassion, hopefully the lines of communication can reopen, and respectful behaviour ensue. Hopefully then, we are acting with intention, not in reaction. Sometimes it just isn’t possible, and I understand that. Sometimes someone hurts us so bad, has just been so horrid that we will simply not put ourselves in that position ever again. This is something that has usually happened over a longer period of time, where the behaviour has been repeated again and again. We give them a second chance. And maybe a third. And then, if there is no value, if there is no respect, if there is no honour then we can walk away, in peace. And wishing them peace. But if walking away in anger, without first trying to establish the lines of communication: if this is the first and only thing we do, then there is very little chance of reconciliation, of compassion, of communication. Maybe we just have to accept that humans will be humans, that they will do and say stupid things, that they have opinions, both good and bad, and we will also have ours, good and bad, stupid and brilliant. But if we stop talking to them, we lose all chance of hope for a future together. There is so much divisiveness right now, in this so-called United Kingdom. There has been blood shed, a life lost, and more death threats to others because of fear, because of lack of communication, because of ignorance, because of poor communication, because of misinformation and manipulation. There is a growing blatant and overt racism and prejudice, fuelled by ignorance, by fear. If we are talking to each other, then maybe this can be overcome. Where we are no longer talking, there is no hope for change. We need to change the way we communicate. Right now. Working on my online course for Zen Druidry and putting into words a deeper exploration of Zen Buddhist concepts with Druid philosophy and way of life has opened my eyes even more to the wonder that is life, the suffering and the joy that we create and the freedom in distinguishing between the functional ego and the representational ego that causes so much unnecessary difficulty in our lives. I think meditation is the key to unlocking these concepts, for by stilling the body we can still the mind enough to see clearly, to ponder concepts such as the Four Noble Truths and the Eightfold Path in a Druid context with a deeper insight as a result of simply being quiet and mindful. I sit in meditation for 30 – 40 minutes a day, with a large chunk of that time being spent simply being present in the moment, in all its pain and glory, up and downs, its successes and difficulties. It’s a simple thing to do, but can be quite difficult to do when we begin to realise just how our minds work, and how hard it is to let them be, to not get attached to thoughts and feelings and simply be the observer of the mind’s functioning. We love to judge, we love to recreate scenarios, we love to think, think, think about everything to the point where we leave our bodies behind. At the other extreme we run our bodies into the ground and by doing so, without stilling them for any amount of time our minds become as frazzled as our nerves and we cannot find any sense of peace. Sitting in silence, we can feel extreme joy even as we can feel extreme pain. Our attachment to either is what causes us suffering. When we attach to joy, we want to feel it over and over again, and crave it, striving for it with all our being, sometimes living lost in the future anticipation of that joy, or lost in the past of when we had it in our lives. Our attachment to pain causes us to suffer further, again becoming lost in the future with thoughts of “when will this pain every end?” or lost in the past “this is the cause of my pain, if only…”; when we drop our attachment and simply be in the present moment, we can take care of our thoughts and our emotions with great skill, thereby being compassionate to ourselves. When we sit with either joyful or painful feelings, when we observe them without judging them or anyone else, when we simply see them as a part of life, as an emotion, we can also begin to understand their impermanence. Buddhism talks a lot about the impermanence of everything, and this is reflected in the Druid tradition of honouring the ever-changing cycles of life. We look at a river and see that it is never the same river twice, but constantly flowing, moving downwards to the sea, being filled with rain and experiencing a cycle of existence that has no single, unchangeable part. When we see concepts of birth and death both within a Druid and Buddhist perspective, we realise that there is no such thing as a beginning or ending that is so often tied to these concepts. They are simply events in our lives that all things experience. My view is that we are all a part of nature’s soul, that everything that exists is nature undergoes changes in form through transformation, energy being patterned by conditions and environment in an endless cycle. When we see life in such a context, we see that joy and suffering are also impermanent, and we are able to sit and be with them, to take them by the hand and allow ourselves to experience them without getting caught up in their form, for we know that they are transitory, as are we. In the quiet and stillness we are able to gain a greater perspective of the whole, rather than the chattering monologue that runs through our minds for the majority of our lives. To step outside of our minds is a great liberation. To see the interconnectedness of all things dissolves the separate ego, instead allowing us a deep realisation of the weave of each form in the tapestry of life. We understand and acknowledge the functional ego that allows us to be in this world, while letting go of the representational ego that strives for and causes separation through the illusion of an Us and Them mindset. We’re all in this together. In the Ten Ox-herding Pictures (or The Ten Bulls) we see the final part as being able to work in the world without that separate sense of self. I think this is very important for Druidry and for all Paganism, for if we stop at the realisation of self we are at risk of self-importance. It is necessary to find out who we are, and then to work on letting that go as we realise that self is part of another system, which is part of another system, and so on throughout the universe. Rafting the currents of human emotion become so much easier when we lose the idea of a separate self, for not only are we not hurt by others as much and are able to feel compassion to create a more harmonious and peaceful existence, but we also become a part of the flow of that current. We find that with time our meditation and contemplation allows us to let go of the raft and simply become the river, thereby not having to fight it anymore, or fight to keep our seat as we hurtle through obstacles on our journey to the sea. It’s our choice, however, to do the work necessary in order to achieve this sense of wholeness and peace, for no one can do it for us. 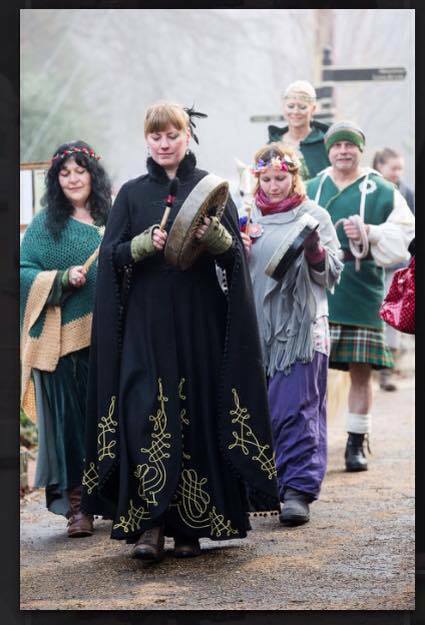 For a look into how Druidry can be related to the Ten Ox-herding pictures, see my post HERE. Druid College, Year 1 this October! We’re getting all geared up for Year One this October at Druid College UK! In Year One We will be looking at core principles and teachings of Druidry, Living with Honour, Rooting in the Earth, Working with the Ancestors, Animism and the Spirits of Place, Listening and Druid meditation, Awen and the cycle of creativity, Working with the Nemeton, Developing Authentic Relationship, Inspiration and the Poetic arts, Storytelling and cultural heritage, The Cycle of Life and the “Wheel of the Year”, Working with the Gods/Deity, Anarchism and the end of Submission, Emotions and “riding the energies”.